You would think that since China has such a long history in martial arts, there would be numerous offerings for kids to begin their studies. While there are a handful out there, they’re surprisingly less than you would guess, and when you factor in finding one that’s bilingual, you are left with just a few to choose from. So we were happy to find out that ALFA Gym in Chaowai Soho is about to start a class of their own specializing in Brazilian jiu-jitsu. For those of you that think that all martial arts are essentially chopping motions and scissor kicks, jiu-jitsu doesn’t entirely fall into this category. This is a martial art that allows for weaker and smaller practitioners to discover how to make use of their size to create leverage, gain control of situations, and defend against a larger opponent. The class, led by Canadian black belt jiu-jitsu champion Albert Cheng, will teach kids not only how to use this efficient martial art to physically defend themselves through control and negotiation (without the use of violence), learning discipline and respect, but also how to verbally avoid fighting through unshakable self-confidence. 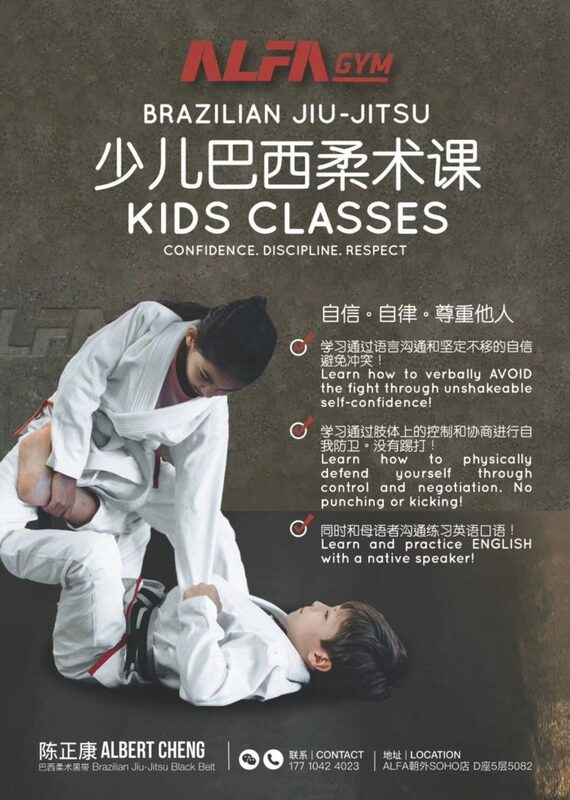 For more information and class times, contact ALFA Gym via WeChat (id: 17710424023), or arrange a visit to observe the skills that these kids will be developing to give you and your child a better idea of what jiu-jitsu is all about.